Score will be reps plus calories on bike. Total calories will be used as a tie break for competition in the event it is required. 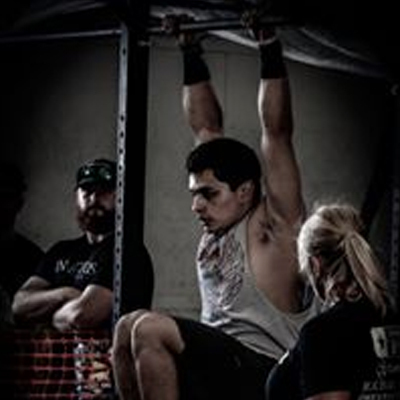 Toes to Bar: The athlete must go from a full hang to having the toes touch the pull up bar. At the start of each rep, the arms must be fully extended with the feet off the ground and the feet must be brought back behind the bar and the rest of the body. An overhand, underhand or split grip are all permitted. Both feet must come into contact with the bar at the same time, inside the hands. Burpee Box Jump Over: The burpee box jump over starts with the athlete facing the box while touching their chest and thighs to the ground and finishes with the athlete jumping over the box. In the box jump over, there is no requirement to stand tall while on top of the box. A two foot takeoff is always required and only the athletes feet may touch the box. The athlete may jump on top of the box using a two foot landing and then jump or step off to the other side, or the athlete may jump completely over the box. If jumping over the box, the feet must go over the box, not around it and the athlete must use a two foot landing. 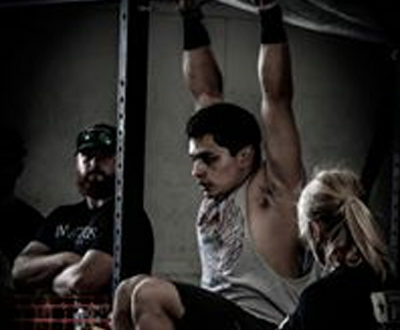 Hanging Knee Raises: The arms and hips must be fully extended at the bottom with the feet off the ground, and the feet must be brought back behind the bar and the rest of the body.